HOUSE NEWS: Can you bring a pizza this Wednesday? LAST CAFE – CAN YOU BRING A PIZZA THIS WEDNESDAY? At the end of each semester we celebrate with all of our friends from the street, volunteers and whomever else joins us by turning our traditional Wednesday cafe into a Pizza Cafe! This will be our last cafe of the 2012-13 year! Bring a homemade pizza (or 2 or MORE! ); come and make one with veggies from our local farmers, the micro-farm, Porters’ Farm and the Green House Garden (be here by 10am to make one); or buy one from one of our local pizza joints (Big Lou’s, Satchel’s, Five Star, Mamma Mia, Italian Gator, Leonardo’s, et al) and bring it to the cafe (between 11:45am and 2pm). Let us know if you’re bringing so we can make sure we’ll have enough! Click here for more info: https://www.facebook.com/events/589119374452142/. We typically go through more than 25 pizza pies, so we hope some of y’all will have some fun and make some or drop a few off. MICROFARM WORKDAY ON SATURDAY: We invite you to join us with Jade Allen and Lynn Chacko, members of the GCW extended community, at their urban microfarm just a few blocks from UF. The microfarm provides produce which is shared with our friends and neighbors at the cafe and through distribution from the GCW. Come volunteer with us this Saturday, from 9am to 12pm, all morning or for an hour or whatever suits your schedule. Address is 415 NW 32nd Street. WINDING DOWN: This week is our last full week of activities before we take our summer sabbatical. The last breakfast is on Friday, June 21, and beginning next week, we’ll be spending time doing a final clean-up of the house. We’re excited to have a couple of youth groups join us next week for clean-up and repair. If you’re interested in helping, let us know. Thanks to everyone! Hope to see you this week! 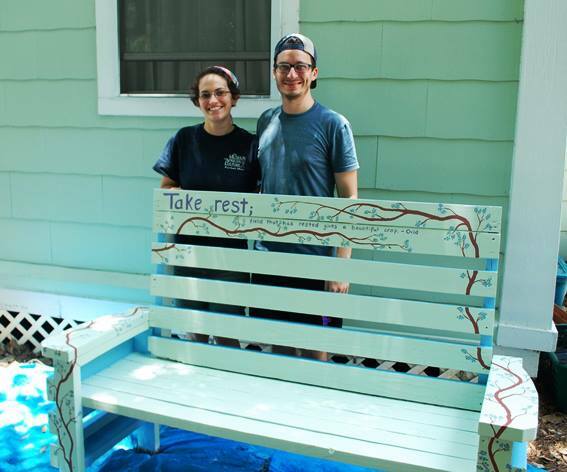 Gloria and Clayton after completing the parking lot oasis bench. THINGS ARE MOVING ALONG! Wow! The house rehab and special projects are happening at a fast and furious pace! As you see above, Gloria and Clayton completed the bus stop bench for the parking lot oasis (with an assist from Mary who donated the bench), and with the help of Oliver, Kelli, Aunt Maggi and others, the parking lot oasis is really coming along nicely. And Chris and Oliver are rehabbing the upstairs bathroom (by far the worst part of the house before the rehab! ), Oliver is building a “free little library” for the bus stop, Gloria and Clayton are painting doors and so much more! Stop by and see the changes! Or write to us if you want to help! Thanks to everyone! STILL LOOKING FOR GOOD, STURDY OUTDOOR TABLES AND CHAIRS: Eventually we hope to build some nice heavy-duty picnic tables for the new outdoor dining area, but in the meantime, if you have good wooden or metal outdoor tables or chairs that need a good home, send them our way! The lighter-weight outdoor furniture seems to get regularly liberated from our backyard, but heavier items seem to stay put. If you have anything you want us to come pick up, we’d be glad to. Just let us know. PUT THE PIZZA CAFE EXTRAVAGANZA V ON YOUR CALENDAR: At the end of each semester we celebrate with all of our friends from the street, volunteers and whomever else joins us by turning our traditional Wednesday cafe into a Pizza Cafe! This will be our last cafe of the 2012-13 year! Bring a homemade pizza (or 2 or MORE! ); come and make one with veggies from our local farmers, the micro-farm, Porters’ Farm and the Green House Garden (be here by 10am to make one); or buy one from one of our local pizza joints (Big Lou’s, Satchel’s, Five Star, Mamma Mia, Italian Gator, Leonardo’s, et al) and bring it to the cafe (between 11:45am and 2pm). Let us know if you’re bringing so we can make sure we’ll have enough! Click here for more info: https://www.facebook.com/events/589119374452142/. We typically go through more than 25 pizza pies, so we hope some of y’all will have some fun and make some or drop a few off.